In December 1980, shortly after former California Governor Ronald Reagan was elected President of the United States, the Institute for Contemporary Studies, a California-based public policy institute (think tank) sponsored the "Black Alternatives Conference" at the Fairmont Hotel in San Francisco. This conference was the largest gathering of black conservatives in U.S. history. The conference challenged both the traditional black civil rights and political establishment as well as radicalblack nationalist spokespersons as the new voice of black America. Economist Thomas Sowell of the Hoover Institution at Stanford University was the keynote speaker. His address appears below. This is a historic opportunity. The economic and social advancement of blacks in this country is still a great unfinished task. The methods and approaches currently used for dealing with this task have become familiar over the past few years and they demand reexamination for at least two reasons. First, the effectiveness of these approaches has been ever more seriously questioned in recent years. There is growing factual evidence of counterproductive results from noble intentions. Some of that factual evidence will be presented here in the sessions that follow. In addition, numerous political trends in recent years indicate declining voter and taxpayer support for these approaches, to which some of the older and more conventional black "spokesmen" remain committed. The events of 4 November were only the most dramatic examples of this. They were not the only examples. In California, we remember Proposition 13; across the country, the defeat of school bond issues and spending proposals. With future elections, the shifting fortunes of partisan politics may change the party labels of those in power. But Camelot seems unlikely to return. And we certainly cannot bet the future of 20 million people on its return. So we have a historic responsibility implied. We cannot simply run around claiming that the sky is falling — popular as that sometimes seems — because that implies that there is one approach which is the only approach. It implies that the partisans of that approach have some monopoly of either wisdom or virtue — which may be a convenient assumption to them, but no reason why the rest of us should take it seriously. What is a more responsible approach? First, we need to recognize that many methods were failing even before they lost public support. We have to accept the challenge of reexamining why these approaches were failing. We need to accept the responsibility of seeking and devising new approaches for the decade ahead. That is why we are here—to explore alternatives, not to create a new orthodoxy with its own messiahs and its own excommunications of those who dare to think for themselves. The people who were invited to be presenters and discussants here are people who are seeking alternatives, people who have challenged the conventional wisdom on one or more issues, people who have thought for themselves instead of marching in step and chanting the familiar refrains. The various speakers and discussants have varying philosophies and different areas of expertise. Some are Democrats, some are Republicans, and some like myself are neither. We are here to assess where we are, where we are going, and what are our alternatives. We can start by looking at the present situation. We have come through a historic phase of struggle for basic civil rights — a very necessary struggle, but not sufficient. The very success of that struggle has created new priorities and new urgencies. There are economic realities to confront and self-development to achieve, in the schools, at work, in our communities. The sins of others are always fascinating to human beings, but they are not always the best way to selfdevelopment or self-advancement. The moral regeneration of white people might be an interesting project, but I am not sure we have quite that much time to spare. Those who have fought on that front are very much like the generals who like to refight the last war instead of preparing for the next struggle. What are some of the pluses and minuses of our present situation? On the plus side, a dramatic economic rise of blacks during the 1960s, but which has slowed, in some cases stopped, in the 1970s. Many social problems are worsening. Continued disintegration of families; rising numbers of broken homes — one-third of all black homes now — a skyrocketing unemployment rate among black youths, five times as high in the late 1970s as in the late 1940s; runaway crime rates of which blacks are the chief victims (there are more blacks murdered every year than whites, in absolute numbers). There is also a threat of a permanent underclass whose problems seem immune to prosperity, to equal opportunity, or to the advancement experienced by other blacks. We can see on the horizon the rise of racist groups such as the Nazis, the KKK, not only among the ignorant, but in places where you would never expect such groups, where they never had a foothold before. We can at least ask whether, or to what extent, the policies of our times have contributed to these problems of our times. Looking to the future, one of the things that we need to focus on are facts about results — not rhetoric about intentions. We need to look not at the noble preambles of legislation but at the incentives created in that legislation. Very often, legislation intended to help the disadvantaged in fact pays people to stay disadvantaged and penalizes them to the extent that they make an effort to rise from disadvantage. I mentioned that in the 1960s there was a dramatic increase in black income relative to white as well as a dramatic increase in numbers of blacks in high-level occupations. Much of this has slowed down, and in some cases stopped, in the 1970s. We need to ask whether the policies that were followed in the 1970s had anything to do with this. The question is not whether on the one hand "affirmative action" sounds better than "equal opportunity," but whether, in fact, the results show further progress or slowing down. There are some serious economic reasons why the latter would be so. When we talk about rent controls, we need not be satisfied with clichés about affordable housing. We need to ask the factual question: will there be more housing or less under rent control? When we talk about minimum wage laws, we need to ask not whether a decent wage is a good objective, but whether there will be more jobs at higher pay or no jobs and no pay for increasing numbers of people. If we are going to talk about the future, we have to talk responsibly. We have to have a responsible dialogue with those who disagree with us. If you are serious, it means you are not concerned with scoring points; you are concerned with confronting the actual arguments, not straw men. We don’t need to talk about "trickle-down" theories. I know of no one who has set forth a trickle-down theory. I know of many people who set that up as a straw man to avoid confronting the arguments that have been set forth by those who want to depend upon different mechanisms and different processes from the ones that are in fashion. One of the other clichés of our times is the "bootstrap" theory: the notion that those who don’t support the current political agenda believe that people should lift themselves by their own bootstraps, should be left to their own devices, that the government is doing too much to help them. There is no such theory. I have been around a few conservative economists in my time and I have listened but have never heard it. I have not seen it anywhere in history. But I see it as a convenient straw man for people who do not want to confront opposing views. The issue is not that the government gives too much help to the poor. The problem is that the government creates too much harm to the poor. The cost of taking care of the poor is relatively small, compared to the cost of bureaucracy. Some years ago someone figured out how much it would cost the government to lift every man, woman, and child in the United States out of poverty by the simple expedient of giving them money. The amount that they came to was approximately one-third of what is spent on antipoverty programs. My fellow economist Walter Williams has figured out how much the welfare expenditure in this country comes to per poor family. It is $32,000. Very few poor families get $32,000. Another device that is often used to avoid taking unpopular arguments seriously is to argue that those people who are opposed to the welfare-state approach are simply middle class. I wish I had a dollar for every time I have been asked whether I came from an affluent background, and if that is why I have such an unfeeling heart for the problems of the poor. I have never heard that question asked of Andrew Young, who indeed did come from an affluent background. Some time ago I met with a well-known TV newsman, and I asked him why it is that I look on television and see black spokesmen saying diametrically the opposite of what I hear in the black community and what I see in Gallup polls and other polls. For example, blacks in this country support voucher systems two to one; blacks in this country prefer more strict enforcement of crime laws, are opposed to quota systems in employment or college admissions, and have never had a majority in favor of busing. And yet when I look at the TV news, an entirely different world is created before my eyes on that tube. And he said to me, "Well, we can put Ben Hooks or Jesse Jackson on TV, but we can’t put the Gallup poll on TV." One of the consequences of this is that we are having, in addition to the usual conflicts among groups that any multiethnic or multiracial society has, artificial polarization. We are having polarization between a handful of black leaders and a handful of white leaders, many saying things which have very little to do with the beliefs of the people in whose name they are speaking. If we are looking at the future and looking responsibly, we can learn much from the experience of others — which does not mean blind imitation; sometimes it means avoiding the mistakes that others have made. Many of the various policies that I hear being urged as the royal road to salvation for blacks today are policies which were tried and failed repeatedly by the Irish in the nineteenth century. It is true that the black history is unique. But of course, you would have to make comparisons even to know that. And uniqueness is never sufficient reason to avoid learning at someone else’s expense rather than your own. One of the problems that I see is the problem of the political interventionist state. I pose it in categorical terms, as if there is some noninterventionist state. We are really talking about differences of degree. There seems to be a notion that political interventionism that produces earmarked benefits for this or that group necessarily makes those groups better off. But when you think of it, no politician gets elected by sacrificing 90 percent of the voters for the benefit of 10 percent of the voters. One thing that all politicians can do — whatever the party — is to count votes. They may create the illusion that they are helping 10 percent. Indeed, the ideal politician creates that illusion ten times. But since the government is not generating any wealth, government programs mean nothing more or less than robbing Peter to pay Paul. Now, there is no political capital to be made by robbing Peter to pay Paul if you get Peter’s vote and lose Paul’s vote. The real trick is to rob Peter to pay Paul on Monday, Wednesday, and Friday, and rob Paul to pay Peter on Tuesday, Thursday, and Saturday and get both their votes. Fortunately, the government is closed on Sunday. By following this strategy, you can give a little bit to this group, a little bit to that group, and none of them ever ask if what is given to A is taken from B and what is given to B is taken from A.
Let’s look at some of the losses that blacks suffer from the interventionist state. I think the greatest single loss is that the minimum wage laws promoted by labor unions protect their members by pricing black young people out of the market. There is no way to rise up a ladder if you can’t get your foot on the ladder in the first place. Environmentalism, to use the word they like to use — I call it the recreational-land-use special interest — means that, for the benefit of a relatively small group of people, we have set aside vast areas of the United States, an amount equal to one-third of this country, which is to say equivalent to all of the United States east of the Mississippi. Clearly, you cannot set aside that much land, take it off the market, without having the price of the other land rise and having that rise reflected in rents and mortgage costs all across the country. Of course, the government can come to your rescue with projects and subsidies. But, of course, these don’t begin to add up to what you have lost by this vast giveaway to a handful of affluent people. One of the great coups of the whole environmental movement is to avoid talking about people and tradeoffs. You would never dream that there are people who have alternative demands for the same resource by reading the environmental literature. You hear about protecting the environment and preserving "fragile areas." It is very touching. You would never dream that what that means is that one group of people will use the power of the government to put those vast resources at their disposal far below cost and keep them out of the hands of other people who have other uses for them. The recreational land that is set aside is land from which you do not build homes, from which you do not get energy, from which you do not create jobs. We have a protection of endangered species act that is concerned with every weed and reptile. We also need to recognize that human beings are an endangered species, and especially those who are poor. There seems to be a notion that Darwinian evolution may have been a good idea at one time, but we are going to bring it to a screeching halt in our generation. Despite thousands of years in which all sorts of creatures have come into existence and gone out of existence, in which all sorts of ecologies have evolved, totally different from one another, for some reason the particular creatures that we have seen — even if there is only a handful of us who have ever actually seen them -those creatures are to be preserved forever, at all costs. The particular kind of ecology that happens to exist at this moment must be frozen for all future time. One of the problems in dealing with the politics of poverty, and the programs for the disadvantaged in general and blacks in particular, is that vast empires can be built on these programs. These programs definitely prevent poverty among bureaucrats, economists, statisticians, and many others. The poor are also very useful as an entering wedge for programs which ultimately benefit other people who, by no stretch of the imagination, are poor. In New York City, for example, open enrollment was hailed as a great way by which blacks and Puerto Ricans could get into the free municipal universities. It became, instead, a means by which middle-class people who were paying tuition at NYU and Long Island University could now put that cost on the taxpayers. It is true that a handful of blacks and Puerto Ricans did, in fact, get in, but they were swamped by many others. There’s another serious problem, closely tied to the issue of state interventionism, and that’s the notion that the poor, that blacks, are guinea pigs. They are subjects out there for every "innovative" idea that pops into the head of some academic. That they are there to provide raw material for surveys and schemes of various sorts. Above all, that their freedom of choice is to be denied in order to correspond to the grand designs of people who think they know better. One of the more remarkable editorials that I saw a few years ago appeared in The New Republic as an argument against vouchers. The argument was that if you had vouchers, then those black parents who were most concerned about their children and most knowledgeable would pull their children out of the public schools, leaving behind only those whose parents didn’t care. The New Republic thought that was a terrible thing to do. While every other group in this country has risen layer by layer as different people began to seize opportunities, blacks alone must all be held back until such time as the very last person in line has understood the value of education. What this betrays is a proprietary conception of blacks somewhat at variance with the spirit of the Thirteenth Amendment. Insofar as we are going to enlist the intelligence, the desires, and the commitments of blacks themselves, we have to do so by offering more choice in more areas to let them decide what is best for themselves and not turn that job over to academics and government officials. 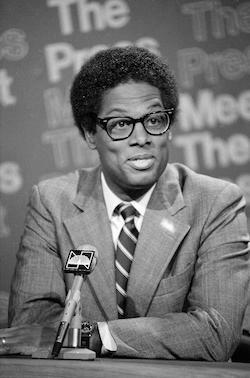 Thomas Sowell, The Fairmont Papers: Black Alternatives Conference, ed. Institute for Contemporary Studies (San Francisco: Institute for Contemporary Studies, 1980), 3-4.